There has been a lot of anger at some instances of overt racism recently and that's good. People should be angry. The sight of a passenger shouting abuse at a woman in her 70s refusing to sit next to her because of the colour of her skin on a flight to London was horrifying. But I would hope people, if they were aware of the more common, more subtle forms of racism, would be just as angry and would call that out too. It's sickening when it happens but because it's so subtle, most of us who are white and therefore not likely to experience it, are oblivious and therefore there's nobody expressing outrage on your behalf online or in person. People being outraged won't take away the pain of what you've had to experience but it might just make you feel less alone. The subtle form of racism is the most common, the least visible and the hardest to report or get support for the effects of. 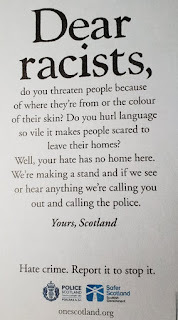 It's insidious and soul destroying & sometimes practiced (sometimes unconsciously) by people who would never dream of using a racist term, would never dream of shouting abuse and who would probably even get up and intervene if they witnessed someone doing it. 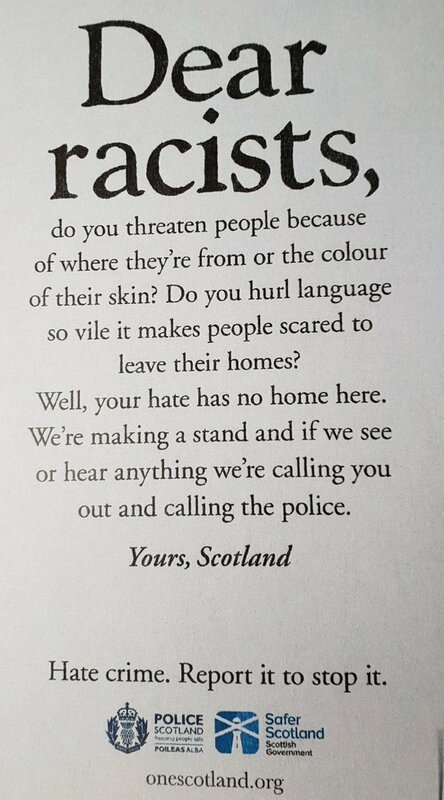 That's why I think the Scottish Government's Hate Crime Campaign and in particular this poster about racism is a great start to a campaign. But it IS just a start. Because most people reading this who DO practice the more subtle forms of racism will simply not recognise themselves in this. That letter is not to them. Don't get me wrong, I'm definitely not critical of this campaign. I think it's brilliant, it could be reassuring, even empowering for someone who experiences racism to read and it says that we, as a country, do not support the abuse being meted out to them. you'll stop and address how you DO think and feel about people of different races. And how does that impact on your behaviour toward them? This is not a definitive piece on my thoughts, as a white person, on racism and I'm sure I'll say more later. It's just a request for all of us (and I include myself in that because I have had to address my own preconceptions about people in the past) to think about it for a little longer than it takes us to dismiss the idea that racism is anything to do with us. 4 years ago today, on 18 September 2014 I remember someone from Yes Provan asking me if we'd be going ahead with our 'party' the following night even if we lost the Independence referendum. Anyway I said that in answer to the question, yes we would go ahead regardless. In fact it was even more important to do it 'IF' we lost because we had some campaigners who were the only one in their family to be voting yes. They would need the support of others who would be equally devastated. But it still wasn't going to happen. We WERE going to win. 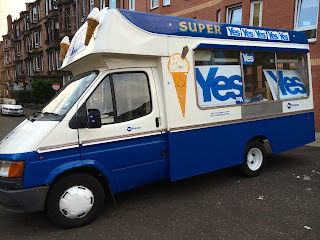 On 19 September 2014 we went ahead as planned with our Yes Provan get together in the Craigpark Masters in Dennistoun. I remember feeling strangely apart from the group. We sat in a big circle, probably about 40 of us, and one by one everyone spoke about how they felt. It had a real support group feel to it with all the laughter and tears these kind of things bring. Most people were crying and if they weren't doing that openly, they certainly had wet eyes. I didn't. I felt really odd because despite having campaigned for Scotland's Independence for most of my life and actively EVERY week (and of course, at peak times, every day) for the previous 26 years, I didn't feel emotional. Had I considered that we might lose, I would have told you that would have left me distraught and unable to control my emotions. And also unable to give anymore to the cause of Independence. For years family members had been warning me that I had to think about my own life and my own career and not just Independence. I didn't neglect my life quite as much as they'd have you believe but I've always been very much a 'soon as X happens, I can do Y' kind of person and it was that way with Independence. It wasn't that I was obsessive and I was no martyr but I just didn't want to take my eye off the ball. I hadn't dreamt I would be doing it for decades and to the exclusion of things I should've been able to do alongside the campaigning. It was just how it worked out. So despite almost giving so much of my life to that cause, I shed no tears when we lost the referendum. I was sat in amongst people I'd formed an incredible bond with whether it was those I'd been campaigning alongside for most of those decades or people I'd only met in the last few months. I sat amongst them as many of them wept openly and yet, I didn't. I thought then that perhaps I was just too numb but 4 yrs on, I still haven't cried. The moment seemed to have passed and it felt silly getting upset when I could do something about it. So, like many others I just did what we always did in the SNP after a defeat, I carried on campaigning, working towards the next Independence referendum. Of course, I also got elected to Westminster for 2 years - something I'm sure I'll blog about a fair bit if I actually persist with this blog this time. (I've stopped, started, stopped, started and each time I've thought 'twitter's quicker'!) So, as I say I just got on with it because I didn't know what else to do. But today ... today I find myself unable to read any more of these #indyref tweets. It's too much, too painful. Everything could have been so different. It's all about to come crashing down on us. I don't know if I, personally, will escape the effects of the crash but whether I do or I don't there will be thousands who won't escape. Scotland threw away the one thing that could have averted the crisis that's looming over us - we voted away the power to decide what direction we wanted to take our country in. We get to vote on the direction of course (how very kind of the British Government!) but those votes have to match the rest of the UK and if they don't, tough, we have no choice. It's as we said it would be and it's as it's been all my life. Only for the first time in my life, we, as a country, actively CHOSE to reject the power to decide. I imagine many will find it hard to believe when I say I harbour absolutely no anger and no bitterness towards people who voted NO then but it's true. I feel despair at times, depressed about it but I bear no ill will towards people for doing what they believe to be right. I can't say the same for people who actively lied to voters but I'd rather spend my time on people with good motives, however they voted. But I do wonder who could possibly think now that it was the right decision? I'm not reading any more, I'm chairing an SNP branch AGM tonight and before I go I'm sending a message to some activists to see if they will come out door knocking with me this week. It's been interesting the last few weeks, the numbers are still small but if the results we've been getting in Easterhouse, Carntyne and Balornock are replicated across the country, we will win the next referendum. I do think it's odd that I've never cried about the 18th September 2014 but I think I always knew deep down that our chance would come again in the not too distant future and that when it did, we wouldn't just win but we'd take the people of Scotland with us. I think maybe I've been saving my tears for THAT moment. I have been blogging as Indygal for 11 years on and off. And for the last few years I've been saying I'm going to restart. And I do. Then I stop again. It's harder to blog these days when you've 'got to' check Facebook, Twitter (3 accounts or pages on each, private messages and public), text messages, emails (3 email addresses) and the news before you can do anything other than get out of bed. Yes I know nobody HAS to do that and it's something I'm working on because if I'm honest, I think I'm in danger of becoming addicted (maybe you should check if you are too). It's not that it's an 'addiction' I enjoy although sometimes I do. It's more that I feel if I don't check absolutely everything, I could miss something of monumental importance and ... well I don't know what I think the 'and' could be. All I know is there are days when I finally finish checking and realise it's lunchtime. I can't afford too many of those days. So to add on a BLOG of all things?! Something you have to actually think about before publishing? It's madness. The reason I'm doing it again is because I have an incredibly busy life. I'm lucky. I resent it sometimes but mostly I appreciate how fortunate I am to have so much going on and such a variety of experiences. Trouble with that is you tend to forget what you've done, who you've met, etc. I love reading my Indygal goes to Sri Lanka blog that I wrote when I spent 3 months working out there. If you ask me what I did I could tell you half a dozen things because you can't remember everything - unless you keep a diary. Or a blog! So, I want to remember and savour and learn from every experience I have in this life and that's why I'm doing this blog again. I'll be really happy if some of my posts are read and somebody likes them but if not, I'll be happy just to keep writing all of this for myself.